MarketingPro, Inc. employs electronic storage media on WORM (electronic records stored in non-rewriteable, non-erasable format) Media, and can provide representation that the storage medium meeting specified conditions of rule 17a-4. All electronic records arranged to permit the immediate retrieval of any record that may be requested. 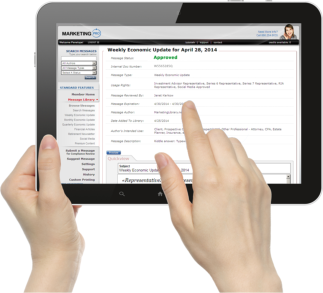 Retention Period: Each Broker/Dealer may determine the period of their record retention. All records (logs and messages) may be retained for 1 year, 3 years, 5 years, 6 years, or indefinitely. 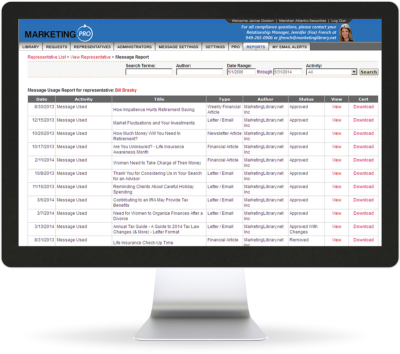 Both the MarketingLibrary system and MarketingPro system provide the marketing resources that Representatives want with the Compliance review capabilities that Broker/Dealers need. An extensive online library of pre-written marketing messages that integrates seamlessly with compliance offices for faster review and approval. Thousands of marketing messages are available for download, including client letters, economic updates, monthly newsletters, financial articles, social media posts, invitations, and more – all written by seasoned financial copywriters. More messages are added weekly, or even daily, as driven by critical national financial news and events. Interacting seamlessly with the systems, Compliance Officers are given instant access to one-click review requests as well as the ability to change, decline, or approve content quickly – with documentation, instructions, and restrictions. The system(s) may also be privately branded with your company identity. Our flagship MarketingPro system is like a virtual post office with built-in compliance surveillance. Representatives may automatically send direct mail with ease. 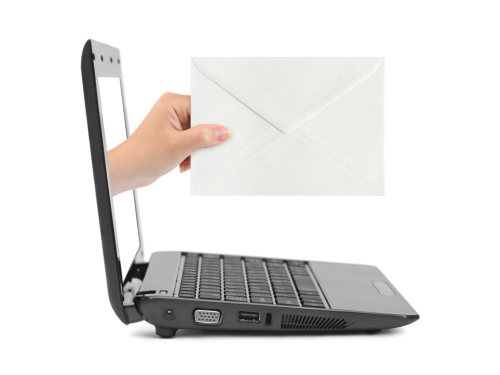 Compliance-approved letters, newsletters, postcards, and greeting cards can be sent directly from the system. With just a click of the mouse, printing, addressing, stuffing, sealing, sorting, stamping, and mailing is done for them at our own, in-house printing and mailing facility. All correspondence is reviewed using our “keyword tracker” feature, which scans for prohibited language. The security and privacy of your data is a core part of our business, and is our top priority. The following is our corporate statement regarding our data security program, and a review of the process we follow regarding our commitment to information security and compliance. The Payment Card Industry (PCI) Data Security Standard is a worldwide standard for payment card and consumer financial data protection. It incorporates the requirements of the Visa USA Cardholder Information Security Program (CISP) and the Visa International Account Information Security (AIS) program, the MasterCard International Site Data Protection (SDP) program, as well as the security requirements of American Express DSS, DiscoverCard DISC, and the Japan Credit Bureau (JCB). VISA and Mastercard now require all merchants to adhere to the PCI security standard. Our compliance with PCI standards is certified by a certified PCI compliance services provider. In order to maintain PCI Compliance certification, all publicly accessible internet devices and any associated domain(s) hosted on them must have been audited within the past 3 months, and all vulnerabilities categorized as Urgent, Critical, or High severity (Level 3 or greater) must have been corrected within 72 hours of their discovery. Our site is tested with industry-standard PCI Compliance remote vulnerability testing. MarketingPro uses Secure Socket Layer (SSL) technology for mutual authentication, data encryption, and data integrity. SSL is the industry standard security protocol to encode sensitive information, such as your credit card number. SSL creates a shared digital key, which only lets the sender and the receiver of the transmission scramble or unscramble information. MarketingPro customer data is backed up to redundant backup servers nightly. We maintain redundant web and database servers, fully configured with all software and data, so in the unlikely event of a failure of any of the main servers, the backup servers will be available, pre-loaded with the most recent production data and software. All customer data is also backed up to two offsite secure locations. Each backup storage location is highly secure and includes alarms, controlled access, fire suppressors, redundant bandwidth, and emergency power generators - everything necessary to ensure valuable customer data is always secure. MarketingPro maintains and regularly reviews, a real-time and long-term event and login access monitoring system. This system helps us meet host-based security information event management (SIEM) objectives and adhere to demands of regulatory compliance requirements like PCI. MarketingPro conducts regular security vulnerability scanning of key network resources, to identify potential security holes. These security scans ensure that web sites, servers, routers, firewalls, and Internet-connected devices are free of known vulnerabilities. MarketingPro services meet the physical and technical standards, and provide all necessary controls for our customers to maintain their administrative security compliance standards. Specifically, MarketingPro agrees to: Implement administrative, physical, and technical safeguards that reasonably and appropriately protect the confidentiality, integrity, and availability of the electronic protected financial information that it creates, receives, maintains, or transmits on behalf of our customers. In summary, MarketingPro has implemented reasonable and appropriate safeguards to protect our customers' financial and business information. Furthermore, MarketingPro agrees to report to our customers any security incident of which it becomes aware, and will authorize the termination of any customer contract in the case of any material breach of this compliance statement.